PSREC offers incentives to encourage members to install ground source heat pumps — the single-most energy-efficient heating and cooling system on the market today! Whether you are building a new home or considering a new heating and cooling system for your existing residence or business, you may want to consider the economical and environmental advantages of GeoExchange technology. 100 percent of the energy entering Earth’s atmosphere comes from the sun. About 50 percent of that (heat) energy is absorbed and stored beneath the earth’s surface in our land and oceans. Earth acts as a thermal battery, maintaining a relatively constant temperature all year long. It does this by being in radiative balance between incoming short wave solar radiation and outgoing long wave infrared radiation. GeoExchange takes advantage of this natural phenomenon to provide clean, renewable, energy efficient heating, cooling, and hot water for homes and businesses. They move rather than create heat. GeoExchange systems (GHPs) in our area deliver roughly 3 units of useable heat energy (Btu/h) for every unit of electric energy input. GHPs deliver warm air — not hot air, and are designed to deliver three to four air changes per hour. With good construction and proper duct design, GHPs supply about a 15 to 20°F temperature rise in heating mode with every air change. If the set-temperature is 70°F for example, the average discharge temperature through a GeoExchange supply duct should be 90 to 95°F. Typical forced-air furnace systems, by comparison, send much hotter air through ducts—heated to as high as 130°F—which may feel too hot and/or dry. Additionally, GHPs provide the added benefit of cooling during summer months. If you were previously using an air conditioner in your home, your new GeoExchange system will be much more efficient and affordable to operate. If you do not need air conditioning, you can choose to save money by switching your system off during a mild summer. This simple technology taps the earth’s renewable, stored energy from the sun through electrically powered ground source heat pumps. A network of sealed pipes (or ground loops), are hidden under a lawn or other landscape. Loops can be installed horizontally or vertically. The available land area and its geological makeup will help determine the most economical choice for installation. The GeoExchange process circulates a nontoxic water/antifreeze mixture through a closed loop system of high density polyethylene pipe that is installed underground and never comes in contact with the earth. This solution transfers thermal energy between the earth’s underground formation and the heat pump. The heat pump uses a common refrigerant cycle to highly concentrate the thermal energy, and circulate it to living spaces via ducted air or hydronic means. A reversing valve in the refrigerant circuit (common to all heat pumps) reverses the refrigerant direction for summer cooling operation. GHPs can heat a domestic hot water whenever they run, but in summer, this benefit is absolutely free. In addition, some of the rejected heat from summer’s cooling operation serves as a flywheel effect recharging Earth’s battery and increasing the heating efficiency during the beginning of the heating season. How is GeoExchange different from other heating and cooling systems? There isn’t a single more efficient heating and cooling technology than GeoExchange. Air source heat pumps, air conditioners and refrigerators all operate similarly in that they use a refrigerant to help move rather than create heat. The GeoExchange ground source heat pump takes this technology to the next level by using the earth itself as a heat source and heat sink, rather than the outside air. The GeoExchange system draws up to two-thirds or more of the energy needed to warm a home or commercial building from the earth. Only one-third or less of the energy used by the system is purchased power, which is primarily used to run the compressor. 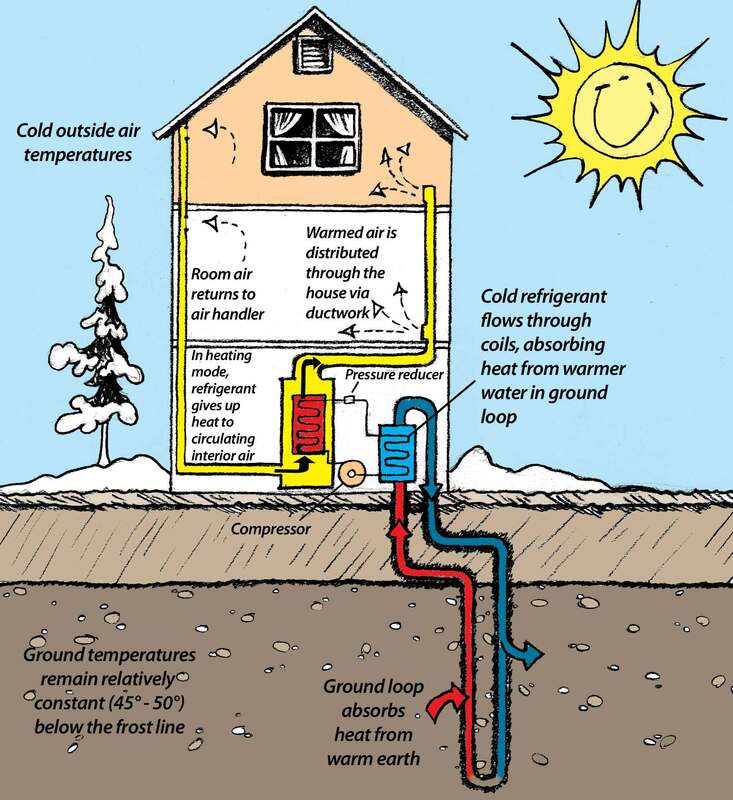 Additionally, GeoExchange provides both heating and cooling with one system. Oil and propane systems require fuel for heat and a separate air conditioning system for cooling. Because your GeoExchange system’s heating and cooling supply resides underground and within your property boundary, there is no outdoor equipment to maintain or suffer damage from the elements or vandalism. Some people add “de-superheaters” to the GeoExchange system to supplement a conventional water heater for added savings on water-heating costs. During the summer, the heat exchanger extracts heat from the building interior and transfers it directly to the hot-water supply. Unlike traditional fuel sources such as wood, gas, oil and propane, GeoExchange produces no combustion or smoke, and eliminates pollution concerns over in-ground storage tanks. GeoExchange systems significantly reduce our dependence on the earth’s finite supply of fossil fuels, and help keep our skies blue. No more trucking of wood, gas, oil or propane to your home or business, further reducing greenhouse gas emissions into the atmosphere. GeoExchange systems are the quickest path to reducing greenhouse gases while simultaneously lowering electrical demand on the grid. Though GHPs run on electricity, the grid is the only energy source that will be powered increasingly by renewables, 33 percent renewables by 2020 and 50 percent renewables by 2030. When married to wind or solar, GHPs offer a unique opportunity to home and business owners to achieve true Zero Net Energy goals. Will GeoExchange work in our climate? Plumas, Lassen, Sierra and Washoe counties are ideal climates for GeoExchange technology, which compare similarly to those found in the upper Midwest of the United States, Canada and Sweden, who leads Europe in GHP deployment. A properly designed and installed GeoExchange system can easily heat a well-insulated building in sub-zero weather where storage of underground thermal energy resides at an average of 40°F or better. The greater the difference in temperature between two adjacent areas, the higher the rate of heat-transfer between them. With that in mind, the difference between the temperature of the nontoxic water/antifreeze mixture in the loops and the ground temperature remains relatively high in the Sierra Nevada in both winter and summer, creating good heat transfer rates. The ground below the frost line (about 3 to 5 feet below the surface) remains at a nearly constant earth temperature ranging between 35 and 50° F in our area. This relatively constant temperature allows ground source heat pumps to operate more efficiently than other heating systems. Plumas-Sierra Rural Electric Cooperative hired Efficiency Services Group, LLC (ESG), an independent engineering firm, in 2009 to complete an engineering evaluation of GeoExchange performance in PSREC’s climate. What follows is a summary of their findings. 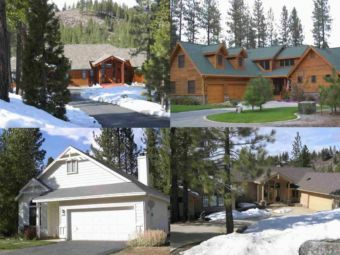 ESG modeled three homes in a range of sizes including 1,200, 2,000 and 3,000 square feet, which corresponded to HVAC loads in our area of approximately 3, 4 and 5 tons, respectively. The study modeled five types of space conditioning scenarios for each home. This method generated 15 different scenarios. 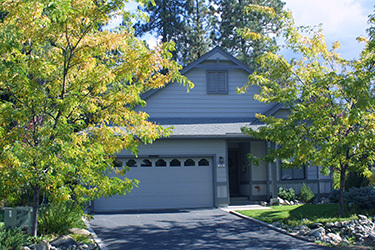 Homeowners can look forward to saving money in maintenance, repair, and replacement costs. Properly installed GeoExchange systems need minimal servicing each year to keep them operating at peak performance. 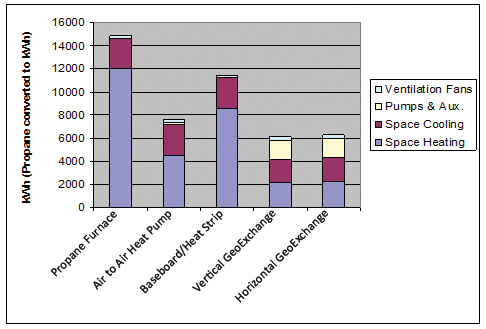 Geo heat pumps last longer than any other mechanical heating and cooling systems on the market. 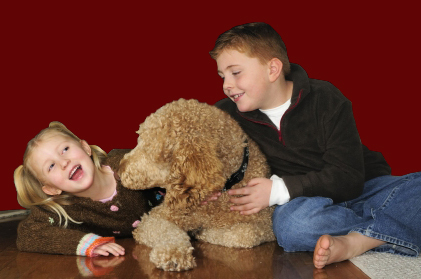 Residential heat pumps have been known to last 35 years or more, with only minor maintenance. The underground loop piping that carries heat to and from the earth is made of high-density polyethylene—typically guaranteed for 25 years and expected to last 50 years or more. The only routine maintenance chores are having the system serviced yearly by a specialist, and changing the air filter each month. Using electrostatic filters that are rinsed and re-used can further decrease maintenance costs. Ground source heating and cooling is the only mechanism that can make use of a contribution by other renewable electricity generation to the grid. GeoExchange systems have earned ENERGY STAR® certification and endorsements by the U. S. Department of Energy and the Environmental Protection Agency. As you learn more about GeoExchange, you will see that it provides more comfort, cost-savings, and is more environmentally conscious than any other system on the market today! I am a PSREC member. How can I get GeoExchange for my home or business? More than 450 of your friends and neighbors have installed this technology with the assistance of Plumas-Sierra Rural Electric Cooperative. PSREC makes it more affordable to install GeoExchange by offering members either a one-time, $600 per-ton rebate (rebate shall not exceed 50% of the total cost of both the heating system and the loops) or a 15-year interest-free, non-transferable loan — a line item added to your monthly electric bill, and based on the size of the GeoExchange system you install. For information on PSREC’s loop loan program, including loan costs and a list of accredited IGSHPA contractors in your area, view the document 2018 GeoExchange Exterior Loop Loan Program (PDF). Careful design of your GeoExchange heating and cooling system is critical in order to minimize costs and maximize efficiencies. There are many factors to consider including design, construction, size and orientation of your home; the climate where you live; the geology in your area; and the amount of land available. It is therefore important to discuss your heating and cooling system during your initial conversations with your general contractor when building a new home or business. For other questions or concerns, call PSREC today. Make sure your system is installed by professionals who are licensed in California with no Contractor State License Board sanctions, and accredited by, and follow procedures established by, the International Ground Source Heat Pump Association (IGSHPA). Ask contractor for references of GeoExchange systems they have previously installed. Visit or call these references to ask about their experience and obtain recommendations. Expect a site evaluation so your contractor can make the best recommendation. This should include checking ducts, insulation and other features for building heat loss, including heat loss calculations from Manual J Wright, or similar. Get a narrative description of the system design and mechanics, including a plot plan of borefield or horizontal loop trenching with pipe and depth information. Get written cost estimates from two or three contractors. Ask for a breakdown between equipment and labor and get clarification on any questions. Get a written contract (including all terms, costs and start-stop dates) and a copy of the warranty (on the system and the installation). Be sure to ask for an owner’s manual. Require an inspection/verification measurement of bores (after grouting) or trenches before covering. Call Plumas-Sierra Rural Electric Cooperative if you have any other questions or concerns. Is a GeoExchange system right for me? Discuss your needs for heating and cooling your home, any variations in occupancy, and whether you should “zone” your system. Should I have the loops installed vertically or horizontally? What heating capacity (Btu per hour) does my home require and how is this determined? Will auxiliary heat be required for my home? What is the brand name and efficiency of the system? What type of duct system will be installed and what is the insulation value? How do you seal your ductwork and do you test to verify the seal? How many supply and return vents will be installed and what are their locations? Is my system a single or dual capacity unit? Is my blower (fan) motor standard or variable speed? There are many air filtration options available; discuss these with your contractor. What type of warranty is provided with my system and what is covered? There are many options in thermostat control; discuss these with your contractor. What are the benefits of a de-superheater and should I install one?